These Hawaiian Chicken Kabobs are a colorful and tasty meal for summertime and so very easy to make too! These Hawaiian Chicken Kabobs are anything but boring and taste like a summer party in your mouth! 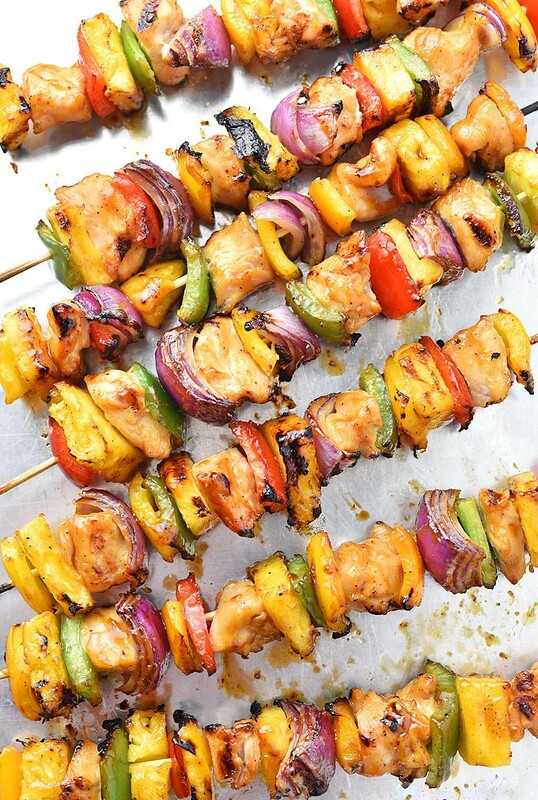 With juicy pineapple, colorful bell peppers and savory onion, these chicken kabobs are fresh and delicious, perfect for outdoor entertaining and summertime parties. For your recipe seeking pleasure, I’ve prepared a few reasons of why I think kabobs are the most fun (funnest?) 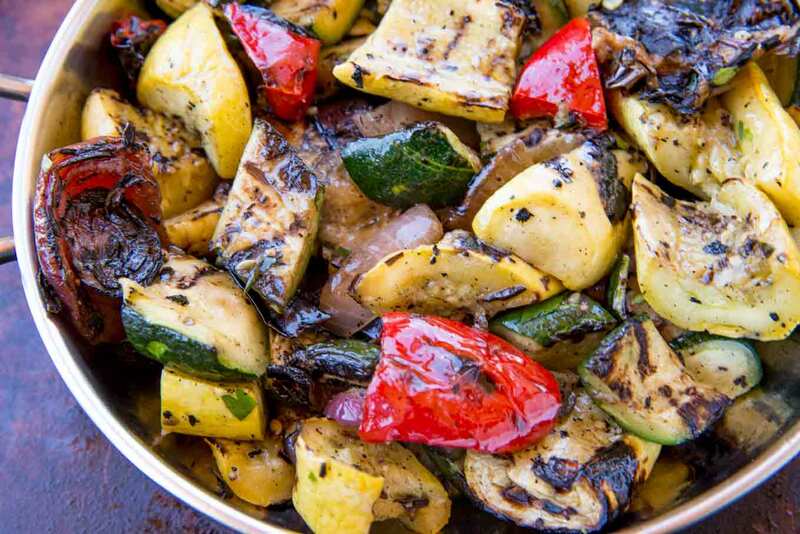 of all summer grilling foods. If you want to skip this nonsense just go straight to the recipe at the bottom. Preparation: Getting these Hawaiian Chicken Kabobs together is all kinds of awesome. You can make them in a pretty pattern or personalize it. It’s like making those macaroni necklaces but for adults and it tastes good and you don’t wear it. Fruit + Meat: In the great tradition of American food, you don’t usually mix fruit and meat, but why not? It’s so awesome and delicious! Like the age old struggle of whether to put pineapple on pizza. I can’t think of any other situations where people would even think to argue about combining meat with fruit, so just do it, pineapple with anything is wonderful! Pretty Colors: Most summery, outdoor foods are delicious, but not particularly pretty (I’m looking at you barbecue pulled pork). 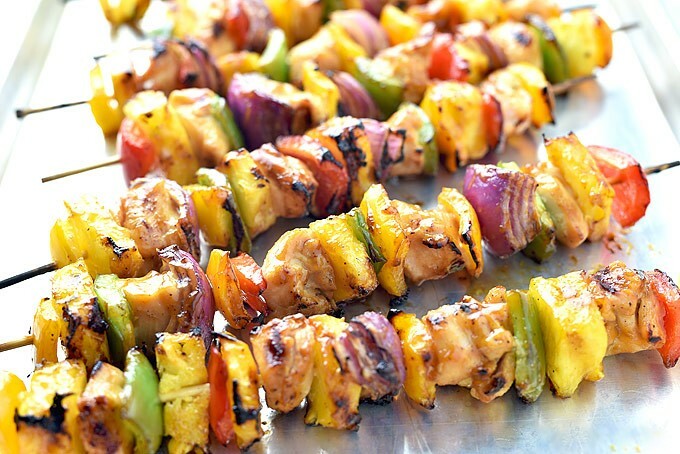 But these Hawaiian Chicken Kabobs are so colorful and pretty! No shame if you match your outfit to your kabob, or your kabob to your outfit. They’re eye-popping on a picnic table and 100% instagram worthy. Now I’m no Buzzfeed, but that’s a pretty dang good list if I do say so myself. As for the Hawaiian Chicken Kabobs recipe itself, it’s super simple. 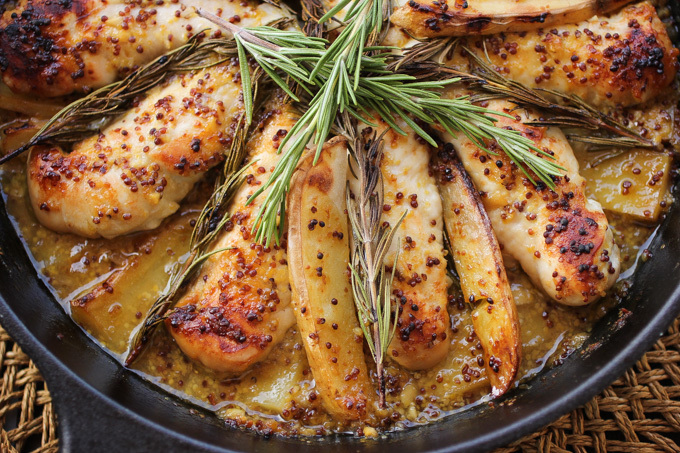 First, whip up the marinade ahead of time by combining the spices and various oils and juices. The chicken needs some time to marinate before cooking, so just make sure you’ve got that taken care of before you even think about getting hungry for dinner. Save half the marinade to baste while the kebobs are grilling. 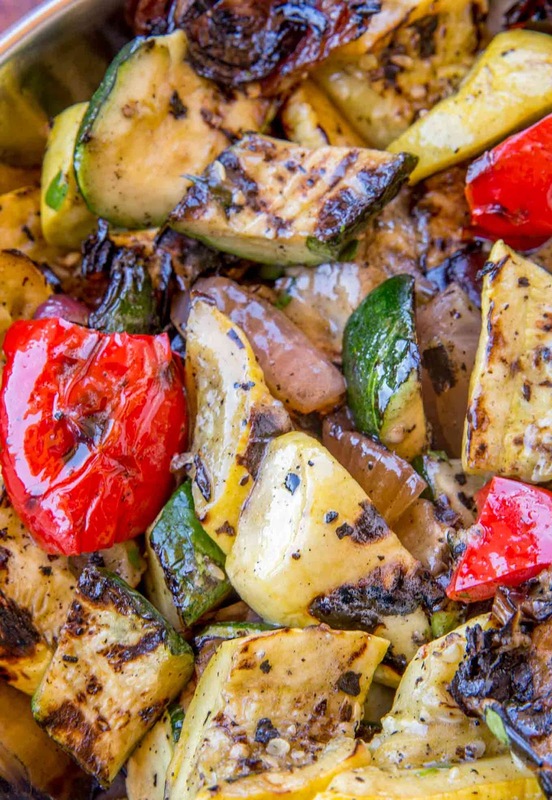 Once you’re ready to fire up the grill, go ahead and thread the chicken, peppers, onion and pineapple on the skewers and brush a bit of olive oil on the veggies. 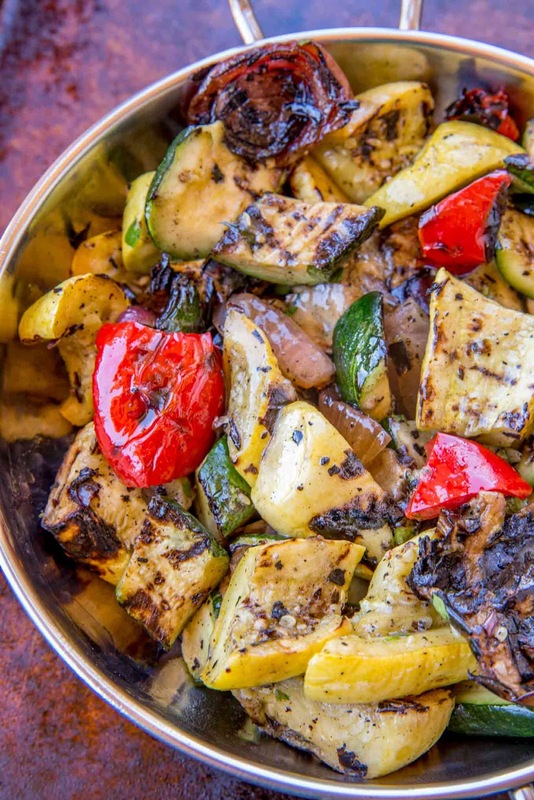 Oil the grill grate and place the kabobs on medium heat, turning every 4-5 minutes. Don’t forget to baste! Grill until the chicken is done, which takes about 15-20 minutes. Pop those suckers off and enjoy! 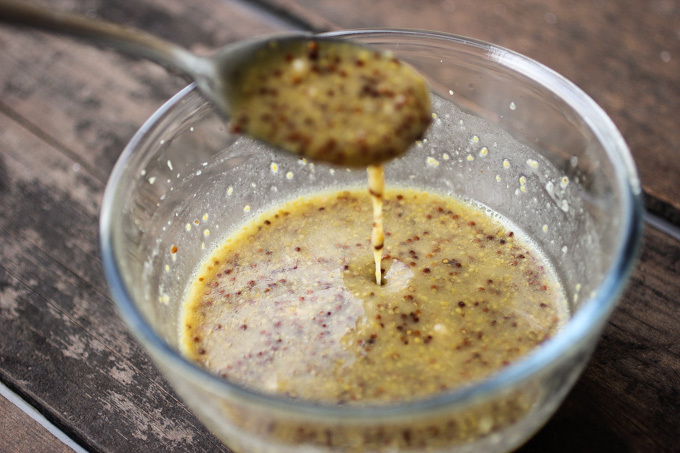 Create marinade in a small sauce pan over medium heat by whisking together soy sauce, pineapple juice, honey, sesame oil, garlic powder, ground ginger, salt and pepper. Bring to a simmer. Separately, whisk together cold water and corn starch until combined. Slowly stream cornstarch mixture into marinade. Whisk all together. Return to a simmer; allow to simmer, whisking occasionally, for 3-4 minutes until marinade thickens. Remove from heat. Set aside. Place diced chicken in a large plastic zip-top bag or bowl. Add half of marinade; toss to coat chicken. Seal/cover chicken; refrigerate at least 1 hour up to 4 hours. 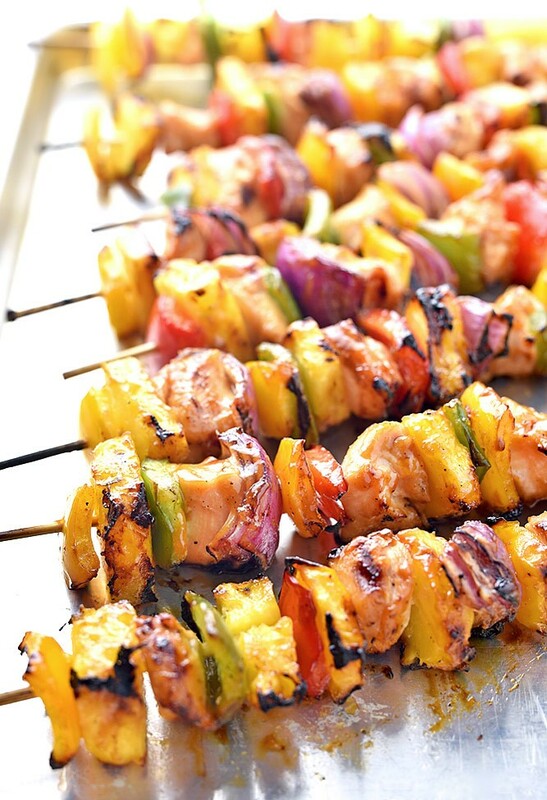 If using wooden skewers, soak in water for at least 30 minutes. Alternately thread chicken, peppers, onion and pineapple onto skewers. Brush olive oil on vegetables. Oil grill grate. Place kabobs on grill over medium heat. Grill, turning every 4-5 minutes and basting with remaining marinade until chicken is done; about 15-20 minutes. Marinade can be made ahead, then kept covered and refrigerated for up to 3 days. To broil kabobs in oven, preheat broiler. Line baking sheet with baking parchment. Arrange kabobs in individual layer on baking sheet. Place under broiler; broil, every 5 minutes turn and baste with remaining marinade until chicken is done. About 15-20 minutes. 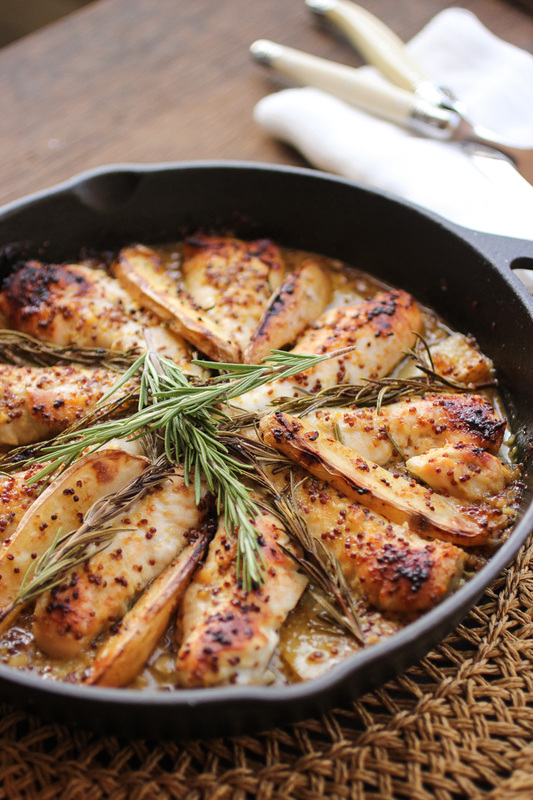 Chicken consumption has been found to be useful in controlling blood pressure as well. This was observed in people with hypertension and in many African Americans, though the diet was also comprised of nuts, low-fat dietary products, vegetables, and fruits. Studies have found that in non-vegetarians, a higher consumption of red meat, pork/ham increased the risk of colorectal cancer, while in chicken and fish eaters, the risk of developing this cancer in later life was reduced, although the evidence is not conclusive. The amount of saturated fat and cholesterol found in red meat such as beef, pork, and lamb are much higher than the levels found in chicken, fish, and vegetables. Therefore, the American Heart Association has advised consuming chicken or fish instead of red meat for a lowered risk of cholesterol and subsequent heart disease development. The AHA also says that consuming chicken or fish must be limited to normal levels, as excessive consumption can also lead to the development of heart disease. Intake of warm chicken soup also provides relief from common cold, including symptoms like a congested nose and a sore throat. 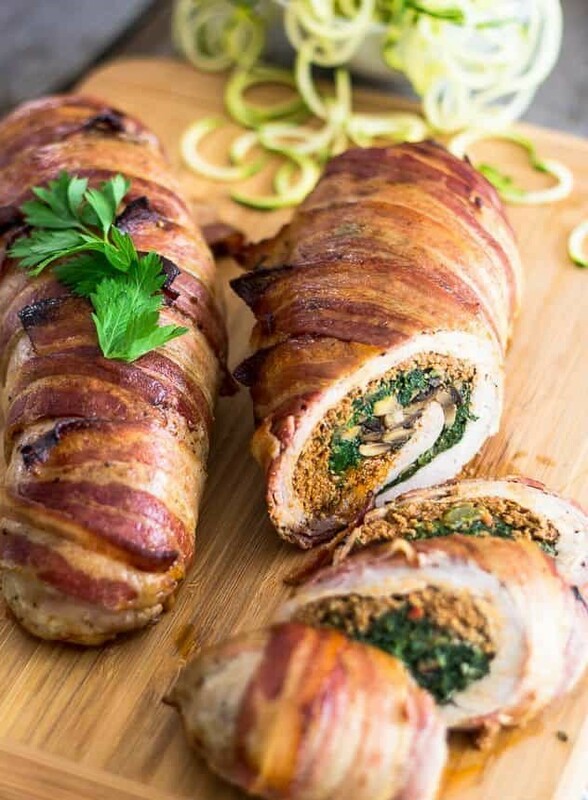 I’d been toying with the idea of making a stuffed pork tenderloin like this for quite some time now. 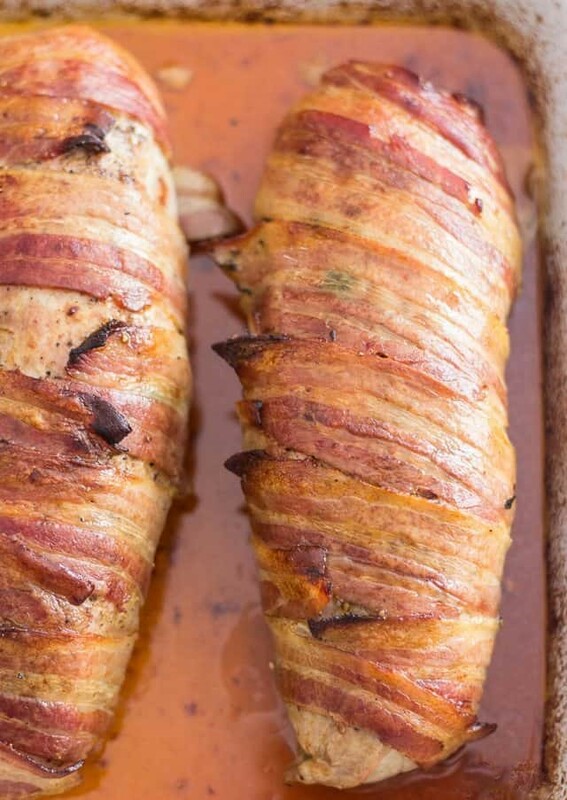 Pork, stuffed with pork, wrapped in even more pork. That’s like pork heaven to the 10th power! OH YEAH! To me, the concept sounded so insanely delicious, it almost had a bit of an indecent ring to it. Did I ever tell you how much I LOVE my pork? Ever since I was a kid, I always said that if I had to choose only one kind of meat to eat for the rest of my life, it would HAVE to be pork. Without so much as a moment’s hesitation. I find that, of all the meats, it is the most flavorful and the most versatile, too. 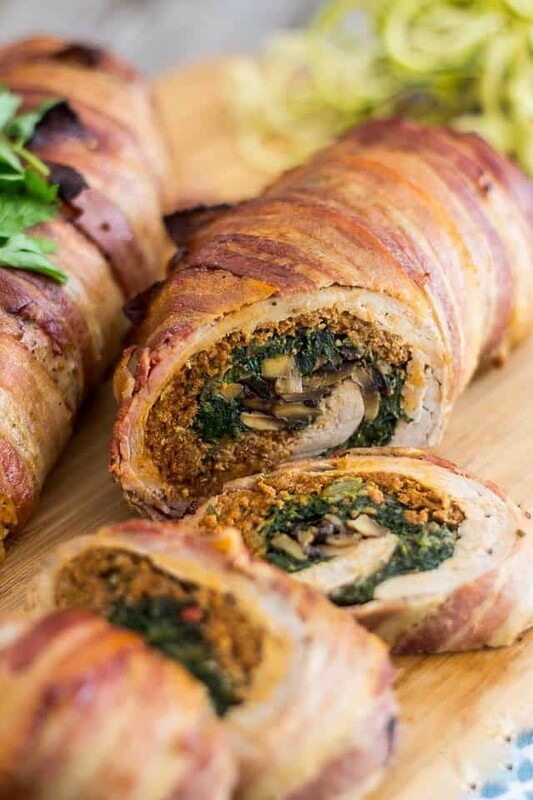 It can be transformed into so many delicious things, like ham and sausage and BACON! Speaking of which, I just got my hands on a whole pork belly last week… You know what that means, right? Oh yeah! Some bacon making action will be happening soon right here, in this very house. I can’t even begin to tell you how excited I am about this. 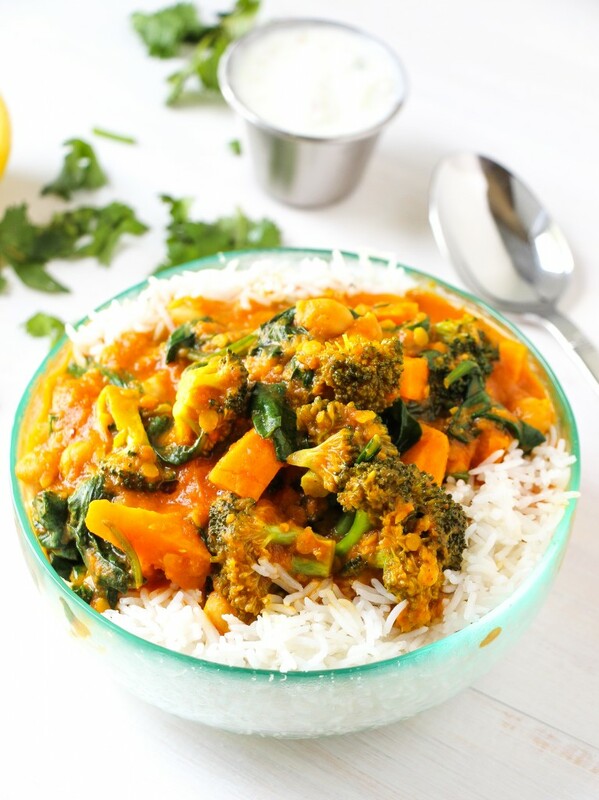 Almost as excited as I am about this recipe which I am sharing with you today. Now this may give the impression that it’s extremely complicated and takes forever to make, but trust me, it’s not the case at all. 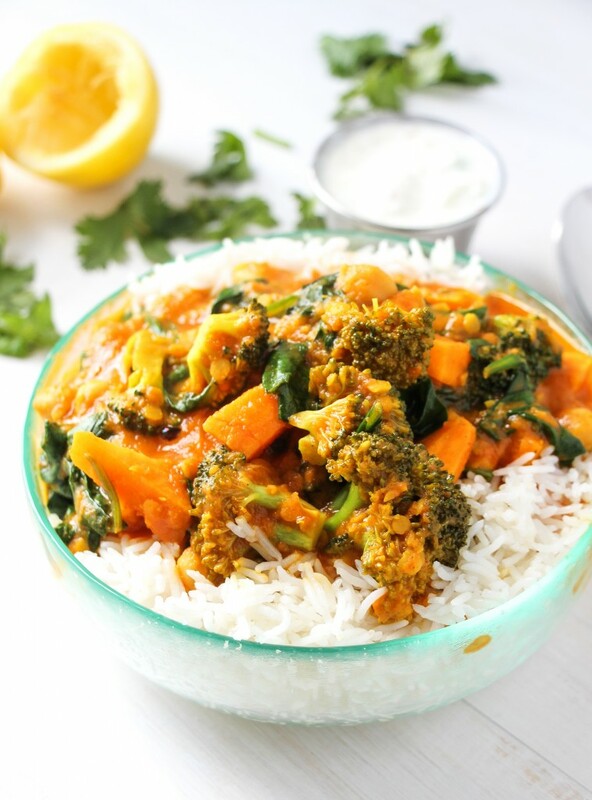 It is surprisingly easy and I’d even say is a very fun and rewarding cooking project to tackle. Plus, I’m giving you tons of pictures to guide you and make it real simple. I’ll give it to you, though. Perhaps this is not your typical quick and easy work-night dinner, but it makes for a fabulous week-end family night feast, and believe me when I say that it’s worth EVERY SINGLE MINUTE you will spend working on it… and then some. So are you ready? Let’s do this guys… one step at a time! Melt 1 tablespoon of ghee in a large skillet set over medium heat. Add onion, salt and pepper and cook until the onion turns translucent, about 3-5 minutes. 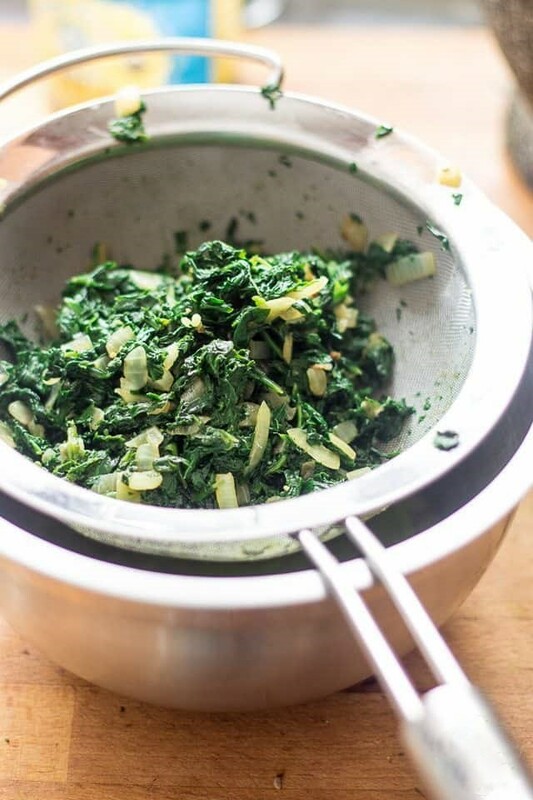 Add a MOUNTAIN of chopped spinach to the skillet. Yes, this may seem like a lot, but you all know what happens to spinach when it cooks, right? Then transfer your spinach to a fine mesh sieve and set it to cool for a few minutes. Meanwhile, return your skillet to the heat source and melt the remaining tablespoon of ghee. Add the mushrooms and cook until softened and golden, about 2 minutes. Remove from heat and set aside to cool. Now, you want to squeeze as much water as you possibly can out of the spinach. I like to do that by pushing it down with a small plate or the back of a ladle. See all the liquid that’s coming out? Make sure you get every last little drop. And that leaves you with yet even less spinach to work with! But that’s okay. We still have plenty! Now slice your tenderloins open. 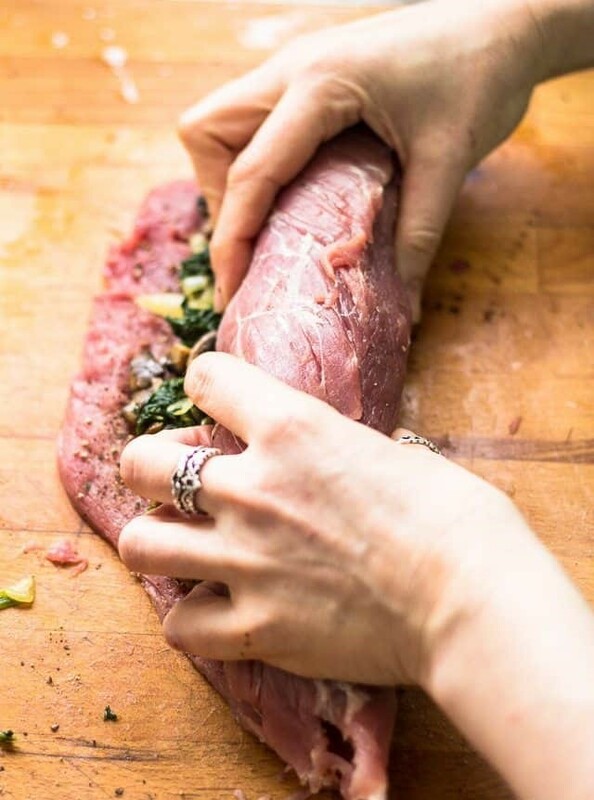 To do that, place the blade of your knife parallel to your cutting board, put your hand flat on top of the tenderloin and carefully slice down the middle almost all the way to the end. You’ll want to stop about ¾ of the way through.…and, with a meat mallet or small saucepan, delicately pound them until they’re about ½ inch thick. 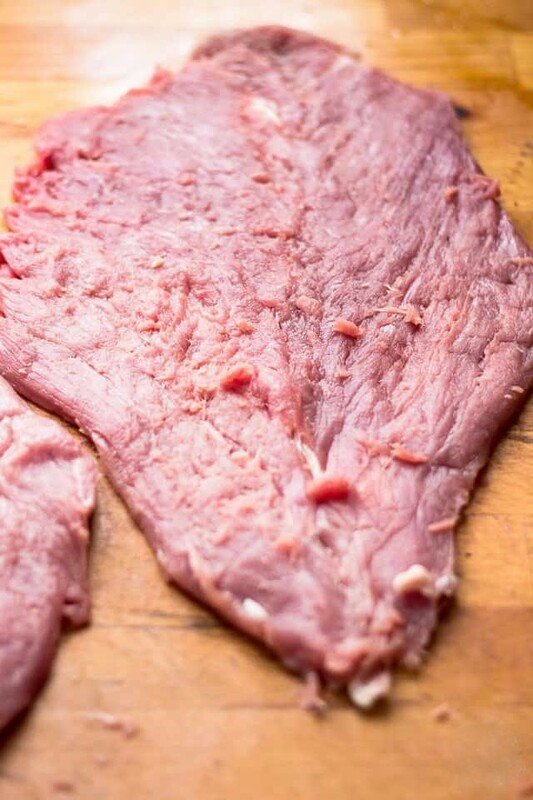 Sprinkle your now flat tenderloins with salt and pepper, then divide the sausage meat between both tenderloins and spread as evenly as possible without going all the way to the edge; you want to leave about one inch all around and even a little bit more on the side where the seam will be. Top with spinach mixture, followed with mushrooms. Roll the tenderloins as tightly as you can, taking care to place the seam underneath, then carefully wrap each of them with the bacon strips. Transfer your now wrapped and stuffed pork tenderloins to an oven safe baking dish. This will go in the oven for a total of about an hour. Once it’s done cooking, you’ll want to let the meat rest for 10-15 minutes before slicing. So you might want to plan on getting these babies started about 2 hours ahead of time. Even if you don’t have a big family to feed, you can very well make the extra roast, pre-slice it and keep it in the fridge for quick and easy access to a delicious meal all through the week. Did I tell you how amazingly good this was for breakfast, alongside pan-fried cauli-rice, some sauerkraut and fresh avocado? It would work wonderfully with a couple of eggs, too. How could your day ever go wrong after it’s started so brilliantly? But if meat for breakfast isn’t your thing, feel free to end your day with this one instead. It’ll be just as brilliant! Add chopped spinach and cook until just wilted. Transfer the cooked spinach to a fine mesh sieve and set it to cool for a few minutes. Squeeze as much water as you possibly can out of the spinach by pushing it down in the sieve with a small plate or the back of a ladle. Set aside. Now slice your tenderloins open. 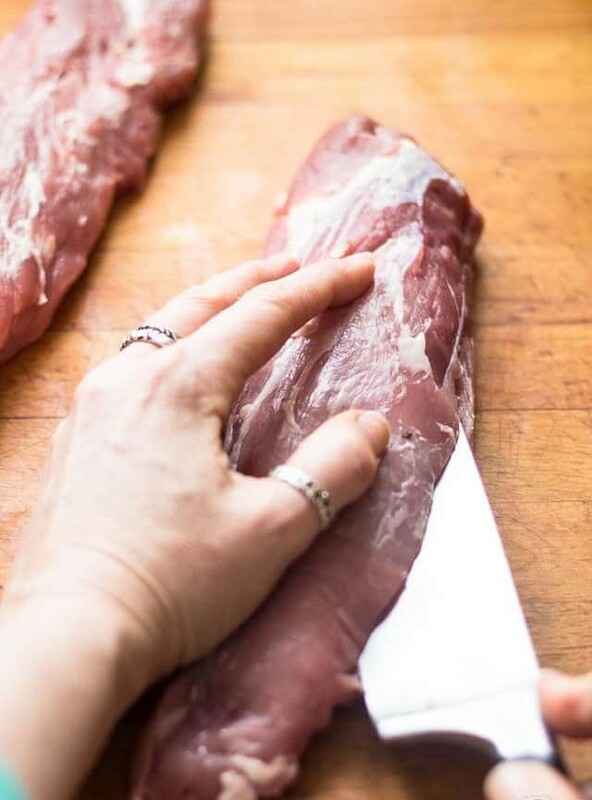 To do that, place the blade of your knife parallel to your cutting board, put your hand flat on top of the tenderloin and carefully slice down the middle almost all the way to the end. You’ll want to stop about ¾ of the way through. Lay the tenderloins open on a cutting board and, with a meat mallet or small saucepan, delicately pound them until they’re about ½ inch thick. 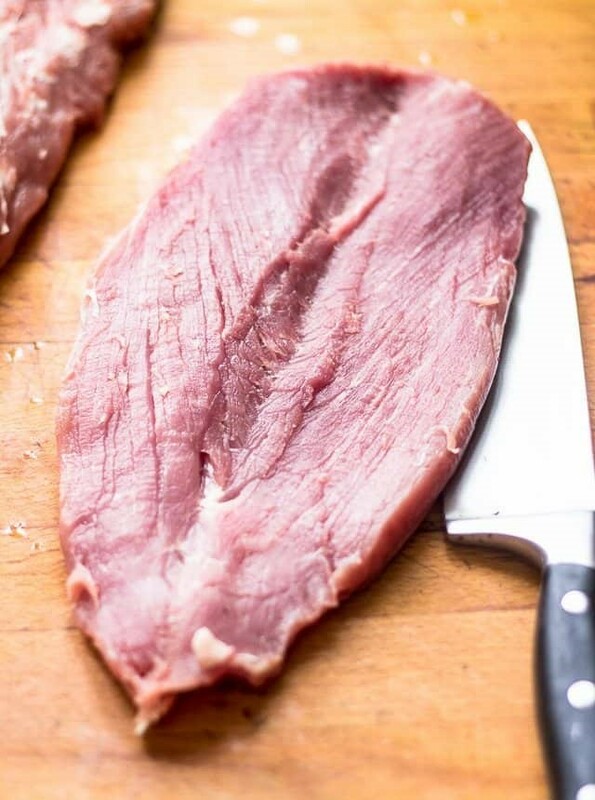 Place your now flat tenderloins on your cutting board, sprinkle with salt and pepper, then divide and spread the sausage meat on both tenderloins, as evenly as possible but without going all the way to the edge; you want to leave about one inch all around. Top with spinach mixture, followed with mushrooms. 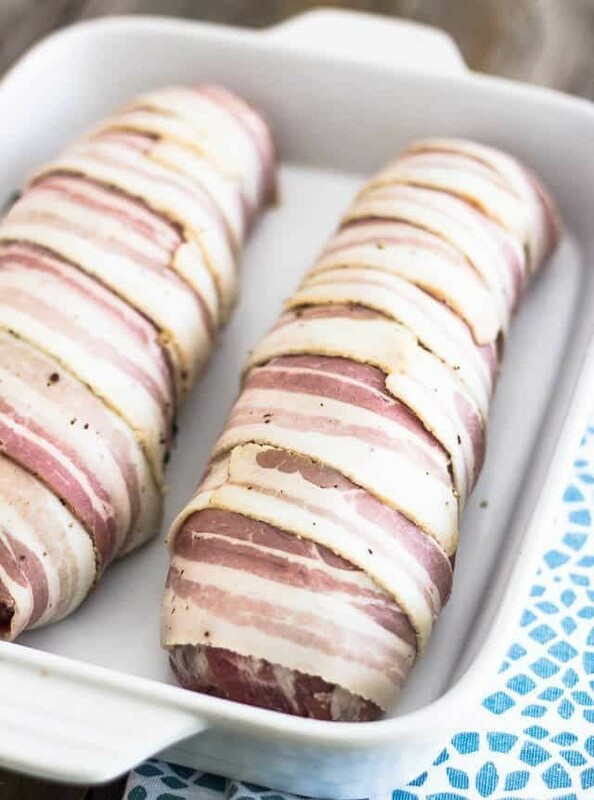 Roll the tenderloins as tightly as you can, taking care to place the seam underneath, then carefully wrap each of them with the bacon strips by simply going around. You should need 5 or 6 strips per tenderloin. Transfer your wrapped pork to an oven safe baking dish, cover with aluminum foil and bake in a 375F oven for 35-40 minutes. Remove foil and continue cooking for 20-25 minutes, basting 2-3 times during that period. Set your oven to broil and finish crisping up the bacon, which should take anywhere from 3 to 5 minutes. Keep a close eye on the prize, during that time: you wouldn’t want your precious bundles to burn! Remove from oven, tent loosely and let the meat rest for 10-15 minutes before slicing. In the unpredictable days of spring where it is sunny and warm one day, drizzly and damp the next, what’s a cook to do? Make a classic, hearty dish that warms the tummy and the soul. 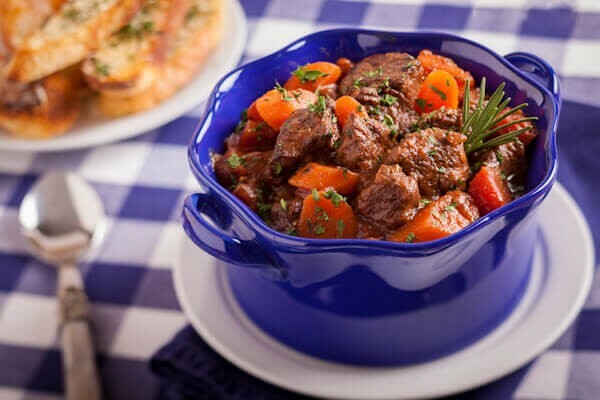 Filled with chunks of top sirloin, carrots, tomatoes and herbs, this vegetable beef stew is a favorite with my family and clients. In stead of hours, this vegetable beef stew takes about 30 minutes using a pressure cooker so you can get dinner on the table fast. 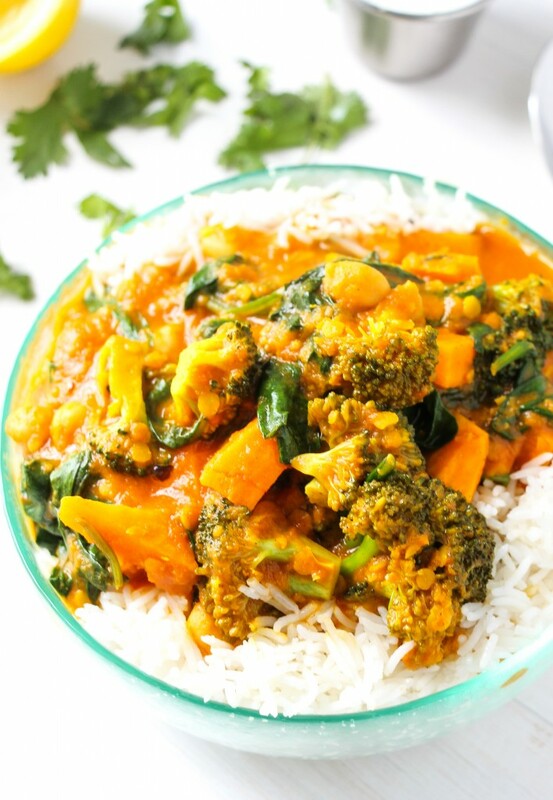 Make this stew on the weekend an enjoy on busy weekday nights. It holds for 3-4 days in the refrigerator, or you can freeze it. If you don’t have a pressure cooker, make it the traditional way. Don’t cook the carrots separately. Add the carrots and tomatoes to the pot, cover and simmer on low heat until the beef is done and the vegetables are tender. It will just take longer. Beef stew recipes generally use stew meat which is a cubed mix of tougher cuts. 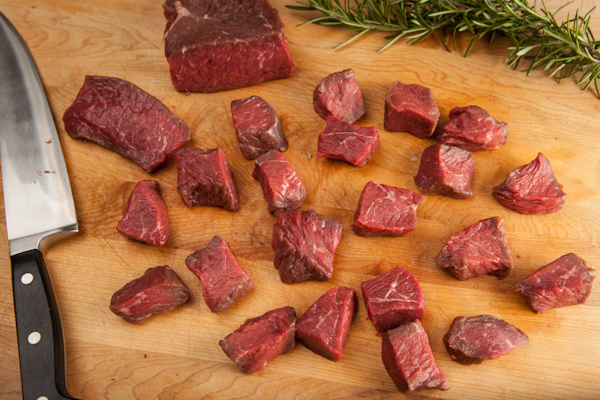 A more tender option is to buy top sirloin. I buy a 2 pound piece and trim away any fat or tendons. After trimming I have 1 1/2 pounds to cook with, which will serve 4, and extra freezes well. Until I became a hawk at understanding labels and ingredients, I used Better Than Bullion. Bullion pastes have unhealthy ingredients like caramel coloring, crazy high sodium, sugar, molasses (sugar), evaporated cane juice (sugar), honey (sugar), beef “flavor” (who knows what that really is), potato flour (in broth? ), and preservatives. A lot of stuff you don’t want to eat. If you have any of these products, throw them out. Use real beef broth or beef bone broth, which is widely available these days. . Most of the boxed stuff is pretty bad too. Higher quality bone broths do cost more, but they taste better and are better for you. Look for them in the frozen department. If the label says “all natural” don’t believe it. That means nothing. Why no sodium? Because that is how you make real homemade broth. Never with salt, so that you control the amount of sodium that goes into your final dish. It’s especially important if you plan to reduce the broth by half for bigger flavor. Reducing a broth with high sodium really increases the sodium in the final dish. A pressure cooker is a worthwhile addition to your kitchen. When not being used as a pressure cooker, it works like any other pot. When you feel the need for speed, the lid can be locked on and the time it takes to cook soups, stews, rice, beans and many other dishes is greatly reduced. In a time-starved cooking schedule, a pressure cooker can be your best friend. Trim your meat into large chunks, about 1 ¼”. Trim off any extra fat, brown the meat and set it aside. Cook the onion, celery and garlic until soft. Add red wine and reduce. Add herbs, spices, broth and browned beef. Lock the lid on and bring to high pressure. Cook for 15 minutes, then remove from the heat and allow the pressure to drop naturally. This will take just a few minutes. When the carrots are cooked with the meat they get too soft. Cook them in boiling salted water for 3-4 minutes while the stew is cooking. Drain and add the carrots after the stew is done. For the tomatoes, they disintegrate in the pressure cooker, so I add them with the carrots at the end. They retain more of their shape and warm quickly when being added to the piping hot stew. Serve in a bowl by itself (paleo) or over whole wheat pasta, brown rice noodles or polenta for gluten free. Finish with a little fresh parsley for a nice shot of green color and fresh flavor. Leftovers will keep in the fridge for 3 days or can be frozen. Add oil to pot over medium heat and brown the cubed beef. When beef is brown, remove to bowl along with the juices and set aside. Add the onions and celery to the pot. If it seems dry, add another teaspoon or two of oil. Cook onions and celery over medium heat, stirring occasionally, until they are soft and translucent. Add garlic and cook another 1 minute. Add wine and cook down for a minute or two. Add oregano, thyme, rosemary, paprika, bay leaf, pepper, and broth. Add the beef back into the pot. Lock the lid on and bring the pressure cooker to high pressure. When the gauge goes up, turn heat to low and set timer for 15 minutes. While stew is cooking, bring a medium pot filled with water to a boil. Salt the water and add carrots. Cook carrots for approximately 4 minutes, or until tender. Alternatively you can stem them until soft. Cooking time will depend on the size of your carrots. Drain and set carrots aside. When stew has completed pressure cooking, turn heat off and slide pan to a cool burner. Allow the pressure to come down naturally. It will take about 7-8 minutes. When the gauge drops, open lid away from your face, being careful of the steam. Add the warm carrots, drained tomatoes and chopped parsley. Serve immediately or cool and refrigerate for enjoying later. Stew will keep in the refrigerator for 3 days and freezes well. For a rich and deeply flavored beef broth, reduce no-sodium broth by half. Start with 1 cup and reduce by half to 1/2 cup which concentrates the flavor. If you don't have a pressure cooker, make it the traditional way with just a few small edits to the directions. Don't cook the carrots separately. Add the carrots and tomatoes to the pot, cover and simmer on low heat until the beef is done and the vegetables are tender. It will just take longer. A note about trimming the meat - because you need to trim fat and tendon, buy two pounds which will yield about 1 1/2 pounds of trimmed meat to cube and cook for the stew. So you like wings, don’t you? Do you like them fried? You probably do. But wings don’t need to be fried. I NEVER fry chicken wings, unless I’m making this buttermilk fried chicken. Why would you want to fry wings? Wings excel in the oven, my friends. 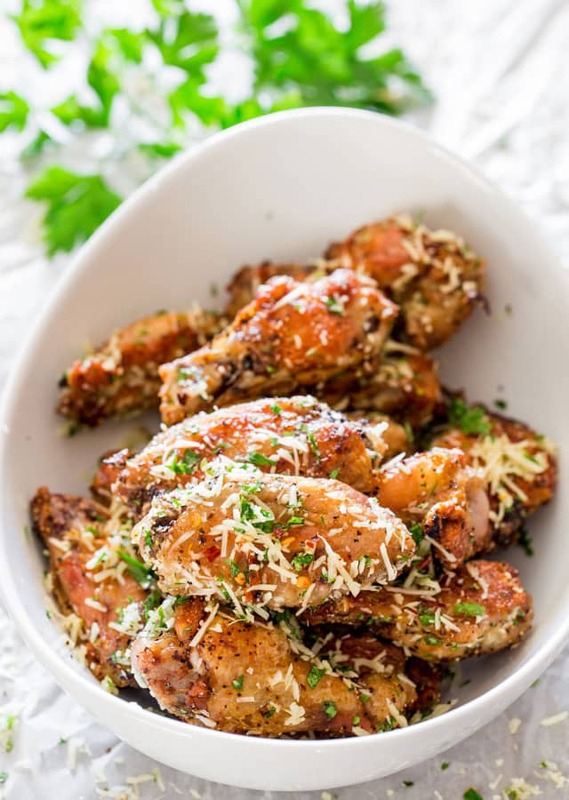 They’re the perfect little pieces of meat surrounded by a nice layer of fat that when baked in the oven, the fat slowly melts away causing the wings to perfectly crisp up to a golden perfection. 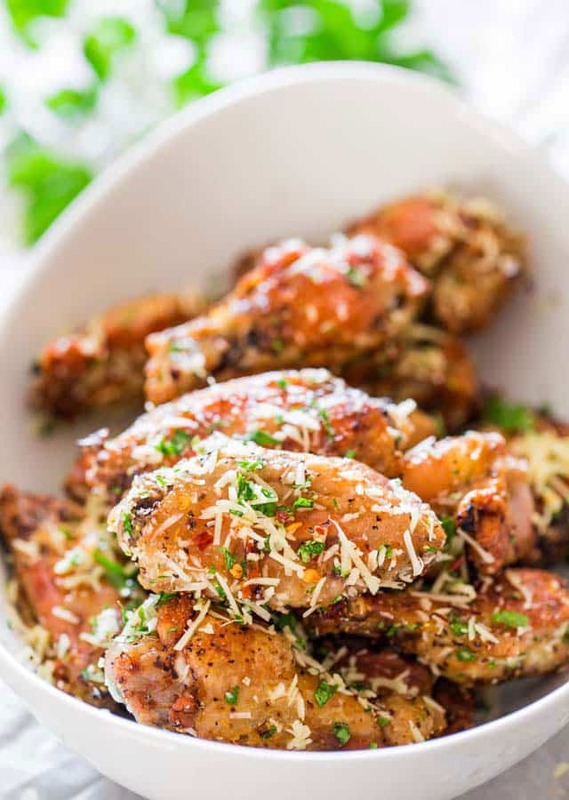 Baked chicken wings are perfection, most of the time I just like them with salt and pepper but then sometimes I like them saucy and sticky and other times I prefer them smothered in Parmesan cheese. 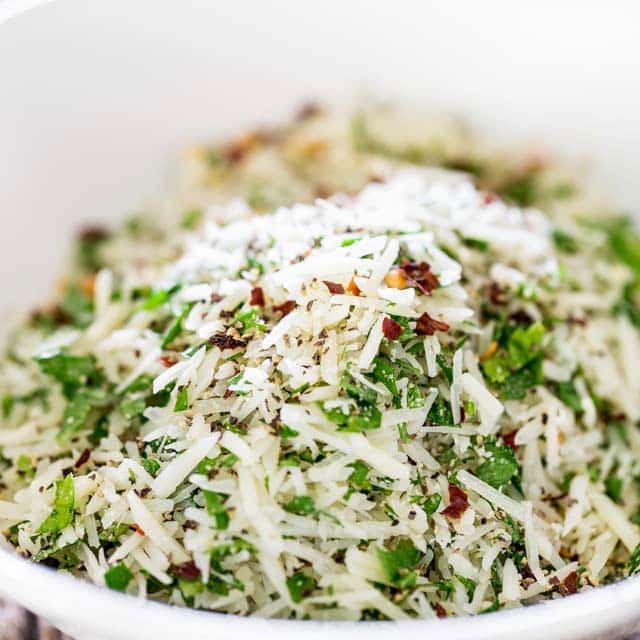 Parmesan cheese with loads of parsley, salt and pepper, some garlic powder and lots of red pepper chili flakes. Oh yeah, you want those chili flakes because that’s how you kick it up a notch and go from ordinary but still good crispy baked wings to extraordinary crispy baked wings with a kick! And I loaded these babies with Parmesan cheese because I’m nuts about it. I think it’s funny that some peeps don’t like Parm cheese because they think it smells like dirty feed, but you need the good stuff, and grate it yourself. The good stuff is really good, still smelly but in a good way. I eat Parmesan cheese on its own, that’s how much I love it, and yeah I do put it on everything!